Bankotsu stood against a tree, "Ask if you need help and try not to torture him Jaky." 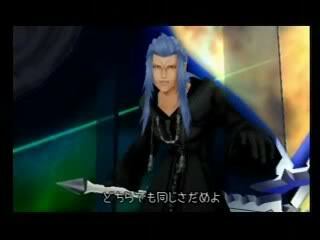 Saix ignored the speech, he couldn't understand it anywaz, he just saw red and roared. He shoved Demyx back with one hand and slammed Lunatic down with the other, sending blue flames and a shockwave at the other man. "What's up?" Kairi asked, looking around. The shrine seemed pretty quiet and peaceful, almost empty, in fact. "Are there Heartless here or something?" Koga appeared out of a whirlwind, landing perfectly on top of Inuyasha's head and smashing him into the ground, "Kagome, about time I stopped by." Inuyasha snarled from his place on the ground. 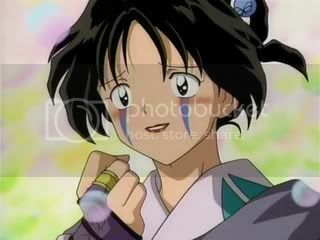 Kagome smiled weakly, "This...is Koga." At first, Kairi was a little surprised, then she realized that after all the stuff she'd put up with, there was no such thing as surprise left for her. "It's nice to meet you, Koga. Um, maybe you should get off Inuyasha. My friends and I are trying to find something, and he's sort of showing me around so I can find it." Koga blinked and quickly grabbed Kairi's hands in his, his tail wagging, "Why hello..." He batted his eyes seductively. Inuyasha raised up from his spot on the ground and coughed. Kairi scrutinized Koga for a moment, trying to figure out who he reminded her of. Then it hit her. He was like Sora, in a way. As in, very easy to read. "Sorry. I have a boyfriend already," she said, removing her hands from his. Koga however, was not thrown off-course at all, "Oh well, wolves have multiple mates and I can just kill yours." Inuyasha snarled and jumped to his feet, drawing Tetsusaiga, "STUPID WOLF." Kagome moaned, "Herrre we go." "No, no, that's not necessary," Kairi replied. "I'm not interested in anyone but him at the moment anyway." She then glanced at Kagome, hoping she would have some quick solution for the cat--er--dog fight about to happen. Before he could even answer his brother the blunettes attack had slammed into some small buhes, leaving the crossdresser in a rather comical position. Sitting he spat out a leaf and glared daggers at the dog demon. Definitely more feral than before, he thought to himself. Standing once more he took notice that his slipper had broken, his new slipper, his BRAND NEW slipper! That was the last straw as he stood kicking off the other slippers partner and charging at the other only to balk, slinging his weapon at Saix angrily. "You insolent fool! Those were brand new, I hadnt even worn them a day yet! Youll pay for your ignorance!" He screamed lashing his blade at the other mercilessly. Demyx, stood there, frozen in place it would seem. He wanted to intervene, but at the same time he didnt want to get in the way and make Saix do anything unneccessary, again. The blond bit into his lip, worrying it thoroughly. His expression morphing his young face into a look of concern for his partner. "Be safe...please..." he whispered hoping that some being would here him and grant his wish. Koga frowned as he was intercepted by Kagome but grinned when offered delicious ninja food, "Thanks Kagome." 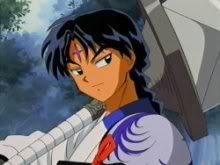 He looked up at the sky and chuckled, kicking dirt at Inuyasha and fleeing. Inuyasha huffed and glared at Kagome, "Why don't you let me just KILL HIM?!" Kagome closed her eyes and sighed, "Sit boy." Inuyasha slammed into the ground. Bankotsu watched the fight with more interest now, seeing his brother all worked up over shoes, it was really amusing. Saix didn't even dodge the weapon as it hit him, he continued charging forward, not feeling the pain and too berserk to see the wounds. His blood dripped behind him as he swung Lunatic into the ground and sent blue flames at his opponent, "Ingrate!" Riku nodded in agreement and continued on. He stared at the remnants of the creature they had just blown up smirked. "Hey, Sora? If more of those things pop up, we should keep blowing them up," he said. At Riku's suggestion, Sora got the same expression as an excited pyromaniac--wait, he was a guy, therefore he was one. "That's an awesome idea!" He pointed forward. "Now let's get going! We gotta find the Keyhole before Kairi!" Yes, Sora was childishly making this a contest. 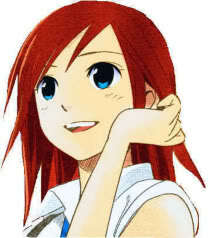 Kairi laughed at Inuyasha. "I need to learn how to do that for Sora," she said between giggles. "Anyway, let's get searching before more Heartless show up and we're interrupted again." Jakotsu screamed as he was overwhelmed by the blunettes attack the forceful impact sending him through 3 not so thin tree trunks. It was silent as he didnt move....blood dripping down his chin from his painted mouth. Was he dead? Inuyasha growled and lifted himself out of the ground, pointing forward, "There....I can practically smell Naraku written up ahead." Bankotsu immediately darted towards his fallen comrade, "Jaky!!! Jaky!!! Hey!!!" He started to shake the man, "C'mon! You can't let this beat you! Three trees is nothing! We're dead!" 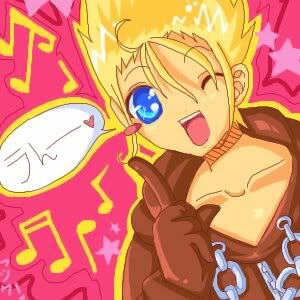 Saix shook his head as his pupils and hair went back to normal, "Huh Demyx? Oh....shards...yes. Superior would want them, we might have to defeat the other though." "What's up ahead?" Kairi asked. "Who's Naraku?" Inuyasha shrugged, "Just about the most evil imaginable, I smell his mansion coming up......along with my brother not too far off." Kagome frowned at Inuyasha's language but let it slide for now, "I hope we don't run into Sesshomaru, that's a whole lot of trouble we don't need." "Huh? But I thought we were going to the shrine?" Kairi really wanted to look through the shrine for the Keyhole. That was the most likely place, after all. Holygrounds tended to be used for Keyholes.